Aakar Patel writes in today's Times of India on "10 reasons why DiCaprio shouldn't preach vegetarianism to desis". The article is about a forthcoming visit to London by RSS chief Mohan Bhagwat for an event of some Sangh group in the UK. Some celebrities like Leonardo DiCaprio and Richard Attenborough are expected at the event to talk about the benefits of vegetarianism. Before I go any further, I would like to state that I am neither a member nor a supporter of the Sangh Parivar. I am a vegetarian by birth and now by choice. Patel, for some reason, includes vegetarianism in a purported "war being forced on a majority by Hindutva". Patel's first reason is that the word 'non-veg' is a word that only Indians use. How that implies that DiCaprio should not talk about vegetarianism is lost on me! Reasons 2 and 3 contradict each other. First he says that 70% of Indians are meat eaters. Then he says vegetarianism hasn't helped Indians as our life expectancy is low and that our incidence of diabetes and cardiovascular diseases is high. Isn't Patel implying the opposite of what he's setting out to prove? It is true that Indians have the highest incidence of diabetes but that is due to historical reasons (many, many years of famines where the Indian genes have adapted to store fat and carbs). In #4, he says vegetarianism does not represent some higher achievement. Okay. So what? The reason many vegetarians are vegetarians is that eating meat seems very cruel. Especially the modern abattoirs which adopt some horrible methods to produce meat cause many meat-eaters to give up meat as well. In #5, he says Patels are the only low-caste folks that do not eat meat and that is because of Hindutva. This may be true. But that does not mean DiCaprio should not speak about the benefits of vegetarianism! What is the connection between the two? Is there some link between him being a Patel and this point? In #6, he says meat-eating is a very low-caste thing and vegetarianism is considered a high-caste thing. This could be true for some vegetarians but this is definitely not the case for all! He then goes on to make a point about Gandhiji's position on meat eating and milk. Again, no connection to the topic at hand. Point #8 is a repetition of Point #5. In the next point, he talks about eateries that have caste related names. Again, Mr. Patel, this is true for only a handful of eateries! Please do not generalise. I honestly have no clue about what #10, a self-confessed digression, has to do with this topic. Many vegetarians in India would say that eating any meat is wrong because of the cruelty involved. Killing and eating a cow is as wrong as killing and eating a chicken. Both are life forms. Both experience the same amount of pain and suffering. No one can justify eating a chicken or a goat if they do not eat cows. Granted, as Patel says, there is bigotry in India. But to make the case for meat eating using this is not fair. Fight bigotry for bigotry's sake. Fight the way some Hindus use caste and the 'holy cow' to attack others. Don't use these to fight vegetarians. There could be some vegetarians who are like what Patel describes. However, make no mistake, there are many who are vegetarian not because they want to be high-caste, not because they want to be pure, not because Gandhiji told them, but because they genuinely want to avoid cruelty to animals. eating chicken is as cruel as eating cow.. true and well said !! 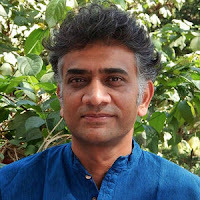 I have no problem with vegetarianism.I do have a problem with people passing judgement on meat eaters.The author of this blog has committed the same mistakes while writing this blog, which he alleges against Aakar. If eating chicken is cruel because it is a living being, then isn't plucking vegetables equally cruel? Aren't plants living beings? If the entire world's population turns to vegetarianism, can you predict the impact on the environment? Can you consider the amount of deforestation to grow crops? Eating is one's choice. According to the author, Aakar's article was filled with flawed reasoning, superfluous and quite badly written. What a pity, the author of the blog was only able to replicate Aakar. A chicken has more senses than a plant. Plants are one-sensed living beings. they only have the sense of touch. Chicken, on the other hand have all five senses. That is why they feel much more pain while being killed than a plant. So, eating chicken is definitely more cruel than eating plants. Coming to the impact on the environment, please see this article: http://www.peta.org/about-peta/faq/how-does-eating-meat-harm-the-environment/. Eating meat has a much more devastating effect on the environment than eating plants. I agree that eating is one's choice and nobody should criticize another's choice. But the point I was trying to make was just that. Aakar Patel was trying to imply that people are vegetarian for the wrong reasons - being high caste, being pure or because Gandhiji said so. Many vegetarians are vegetarians because they want to avoid cruelty.